Recognise this desktop wallpaper? The fish on the left is part of the Acanthuridae family, and is probably Zebrasoma scopas (Two-tone Surgeonfish). The one on the right is from the Chaetodontidae family, Chelmon rostratus (Beaked Butterflyfish). The bad news is that the colours on this picture have been "adjusted" to look prettier. The surgeonfish isn't that orange; closer to the picture above. It's difficult to identify these Batfish exactly, because of the camera angle. But they are from the Ephippidae family, and they don't appear to have been been doctored. 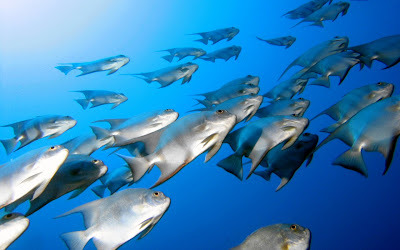 You can find information about these fish and a gazillion others at the FishWise web site: www.fishwise.co.za, run by Dennis Polack, who is an underwater photographer and fish database expert. He has compiled an extensive database 96000 known species of fish, and has accumulated 32000 photographs as well. He is in the process of publishing all of this information on the web. Check it out! Speaking of desktops, I found a free utility that changes the desktop wallpaper without having to get Vista Ultimate or some other bloatware. It's called "Fun Desktop Wallpaper Changer" and it works. It's only 81kb, and you can set it to run when you reboot, getting a new desktop wallpaper randomly chosen from folders. hows the shootout coming along? any progress, eta on results? wich programs do you plan to test? 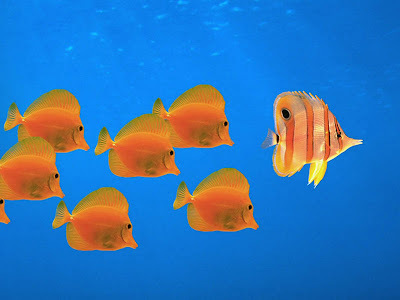 If you look carefully the "orange" fishes have a different perspective to the single fish. This image has definitely been retouched. Waw .. this is nice post guys .. thanks 4 your info :) ..
waw .. this is a nice info guys .. thanks 4 your info ;) ..